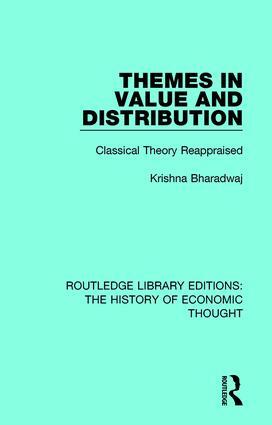 The essays in this volume, first published in 1989, seek to re-examine an important area of economic theory: value and distribution. In a sustained and analytical critique, two principle methodological approaches are compared and distinguished: the Classical or ‘surplus-based’ theories and the demand-and-supply-based equilibrium (DSE) theories. Although the essays are primarily concerned with value and distribution, the critique necessarily extends to the theory of output and employment, and in general, to the theory of trade and accumulation. The book will be an invaluable reader for students of economic thought, capital theory and Marxian political economy.